With its side-address capsule and compact body, this handy little mic can reach the places other mics can’t! The Beta 181 is one of the more striking additions to Shure’s Beta range. This side-address condenser microphone has been making in-roads to the live-sound market due to its durability and practical design. It is ultra compact, and the small-diaphragm side-address capsule enables it to be placed in tight places that traditional designs would find hard to access. This is particularly true for drum kits. The Beta 181 is great for getting in close to hi-hats and snares, where a traditional microphone’s body would get in the way. For toms it can also be discretely tucked in close. However, this is not the only trick the B181 has up its sleeve: it also comes with a variety of interchangeable capsules. These provide a variety of polar patterns from cardioid, super cardioid, figure-of-eight and omni. Each capsule locks to the body with a sturdy locking ring. This is a bit fiddly the first time you try it, but once locked it is a very solid connection and is suitably well engineered to stay in place for the foreseeable future. In fact if you did not know the capsule was removable you would not suspect it was. Shure kindly lent me a pair of B181s to try along with some other microphones from the Beta range. All the mics share the same silver and blue metallic styling. The B181 is almost retro in appearance, with four industrial-looking bolts holding the front mesh to the capsule body. It is one of those microphones that you want to hear, and like, just because it looks good! The first outing was to the studio, where I wanted to listen to the sound of the microphones on a regular drum kit. It was the school holidays so I dragged my percussion-playing son in to play some beats. Our in-house kit is not spectacular but we know it well and the B181s were replacing the AKG C414s we normally use. Straight away they sounded fine. Not being a heavy mic they sat in our Rycote suspensions nicely. Shure do make an isolation mount but it is probably more suitable for live use than in the studio. The side-address styling meant that we could place the microphones quite high if we needed, almost touching the ceiling. In small rooms this can be a real benefit. Initially I tried the session with the cardioid capsules. These are reasonably directional but, switching to the super cardioid, the image was further tightened with no detrimental change in tone. As overheads they compared well but it is on snares and toms that they become very useful. 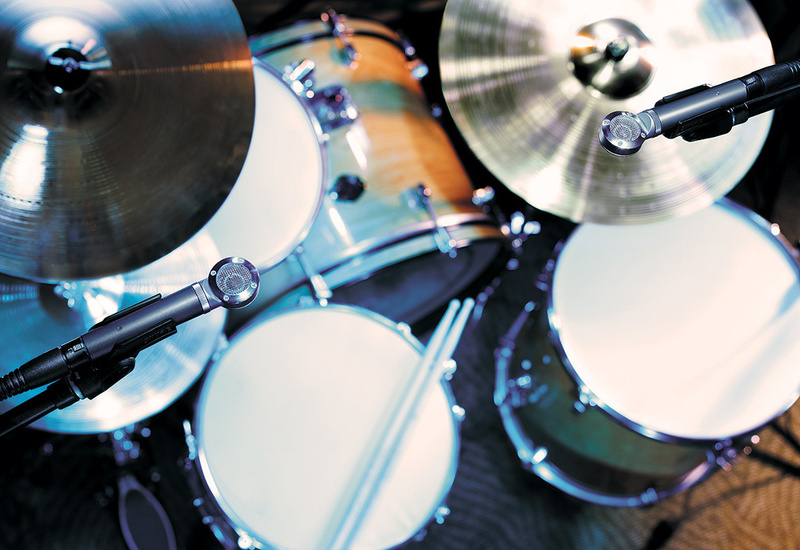 I have always been a fan of condensers on drums since first hearing 414s used in this way. The B181s provide a more practical answer in that they are more adept at being placed in awkward spots, and less likely to be damaged. 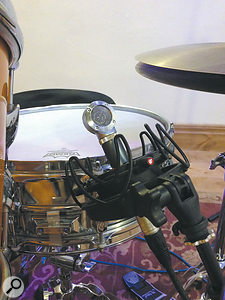 On snare drums the side-address design comes into its own, as it becomes much easier to get the microphone into a position that is (a) capturing the sound you want and (b) unlikely to be clouted by the drummer! The ability of the microphone to handle high SPLs also meant that even really close to the drum there was still headroom to spare. With the omni capsule attached the B181 became an ideal trash mic. Placed in the centre of the kit, it picked up a balanced sound from all sides and, once again, was able to pick up the sound of the kit without any fear of overload. A Shure Beta 181, nestling snugly twixt a snare drum and a hi-hat. Having tried the microphone around the kit in the studio, where it performed all the tasks thrown at it well, it was time to take it out for a road test! I took a pair out on this summer’s festival run and tried them in various roles. I was able to try the mic out on several positions around the kit. The stage volume of the band I was touring with was fairly high, so rear rejection was critical. I ended up using the cardioid capsule at various points around the kit. As an overhead, ride and hi-hat microphone it worked very well. I was particularly impressed with its wind noise rejection: so often you can be half way through a gig and the drummer will move their fan and you will get wind noise on condensers. At open-air gigs things can get even worse, but the B181 didn’t seem susceptible and I had no problems with fan or wind noise even on some very blustery stages. On guitar the B181 performed well. I was using it in conjunction with a dynamic microphone, and it stood up well. It didn’t have quite the fullness in the low end, but it had a more detailed and open top end which really helped the sound cut through. For many guitars this would be a great choice of microphone, particularly if you are looking for a detailed, more delicate sound. I wasn’t looking for anything that subtle, just to capture a guitar permanently set to 11, which it also did without adding a hint of distortion. I did use the microphone on its own for a few songs where I was after a different tone. The way it combined with the dynamic to produce a really full, detailed sound was great and needed little in the way of extra equalisation. Having spent the summer with these microphones it has been hard to give them back, and to be honest I may well be looking at getting a pair. They fill so many roles so well. The fact that they are made to be durable, to stand up to the odd knock, and put up with high SPLs, is very attractive: they are the sort of microphone you will always have a job for. With the advantage of the extra capsules you have an even more versatile microphone. I am not sure if I would have much need for the omni, but a figure of eight can be really useful around the drum kit for capturing large cymbal setups live. I can see this microphone becoming increasingly part of many engineers’ mic lists. I would be happy to use it anywhere a good-quality condenser was required. I may start saving my pennies now. The Josephson E22S and Audio-Technica ATM450 are, like the Beta 181, small-diaphragm side-address mics, but they don’t have interchangeable capsules and are cardioid only. Durable condenser that can withstand the rigours of live use. Interchangeable capsules (cardioid, super-cardioid, figure of eight and omni). Side-address design handy for getting into tight spaces. To buy a set of capsules and the body is expensive, but cheaper than buying separate microphones. A compact, side-address microphone that sounds good, is easy to position and built to last. The interchangeable capsules add to its versatility by giving you a range of different polar patterns. £393 including VAT.Extra capsules £240 each. $499. Extra capsules $249 each.